Configurations Up to 987 SKUs (Unique Products) at 2″ (5cm) bin height. 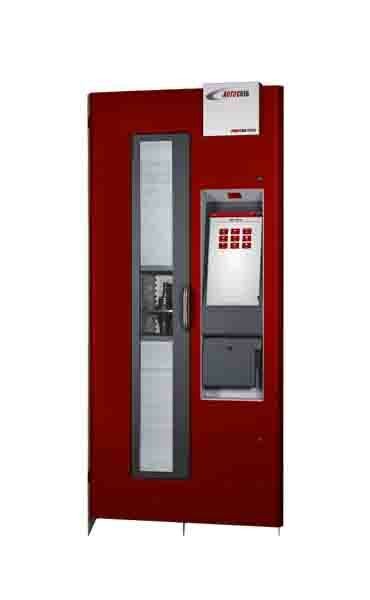 The RoboCrib® TX750 is our next-generation industrial vending machine. Using our exclusive patented dual-tambour system to provide point-of-use access to industrial supplies. This patented bin shelf system, mated with the incredibly flexible "one door fits all" tambour style door, gives the machine the ability to virtually eliminate vertical bin “height” waste that is common with fixed door industrial machines. This means in its most dense (smallest) configuration, the RoboCrib® TX750 stocks up to 987 items! Increase capacity of your industrial vending machine by 30%, while adding incredible flexibility. This saves you valuable floor space and significantly reduces maintenance by reducing the amount of moving parts. The RoboCrib® TX750 is the first industrial machine that was specifically designed to dispense square or rectangular boxes or packages. This practically eliminates the need for repackaging items to fit in helix coil machines or carousels that use pie shaped bins. The dual-tambour approach coupled with an industrial machine that utilizes square bins allows for an incredible amount of flexibility in bin sizes from 2” (50mm) height to 60” (1524mm) height. Dispense square/rectangular boxes, MRO items, and other oddly shaped industrial supply and inventory items. It’s quick and easy to load for restocking. The simple user interface takes maximum advantage of the bin density and flexibility by simply sliding plastic shelves into a rack without tools. The machine walks you through a bin assignment process that is quick and easy. You can set up the machine with little to no prep work as you perform the initial stock or load. Our vast industrial vending experience has found that reducing the number of moving parts significantly reduces maintenance. Utilizing a dual-tambour eliminates over 15 separate sub-systems making the machine nearly maintenance free. The machine comes with a stunning high-resolution 19” touch display, the largest of any industrial vending machine on the market. Use your fingerprint to log in or use traditional methods such as barcodes, prox cards, smart cards, or mag-stripe ID cards.